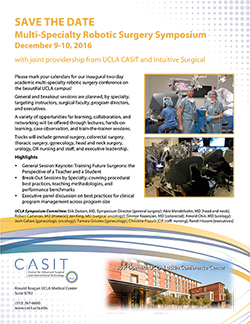 Our inaugural two-day academic multi-specialty robotic surgery conference will take place on the beautiful UCLA campus. General and breakout sessions are planned, by specialty, targeting instructors, surgical faculty, program directors, and executives. A variety of opportunities for learning, collaboration, and networking will be offered through lectures, hands-on learning, case observation, and train-the-trainer sessions. Tracks will include general surgery, colorectal surgery, thoracic surgery, gynecology, head and neck surgery, urology, OR nursing and staff, and executive leadership. We are offering an adjunct research poster session. If you would like to display a poster at the symposium please submit a poster abstract by Mon, November 21st. 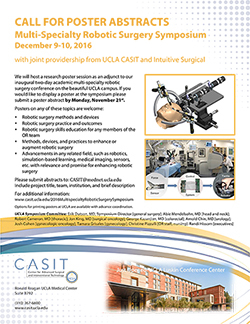 Please submit abstracts to: CASIT@mednet.ucla.edu and include project title, team, institution, and a brief description. Options for printing posters at UCLA are available with advance coordination.